Located in the heart of West Delhi, the Radisson Blu Hotel New Delhi Paschim Vihar showcases a blend of contemporary neo-Gothic design and convenient amenities. A premium choice among hotels in New Delhi, the Radisson Blu adjoins the upcoming D Mall, which will offer a designer shopping experience during your stay. Rest well in the hotel's meticulously planned guest rooms, and enjoy a wide array of world cuisine in a number of on-site restaurants and stylish lounges. Allow yourself to be fully pampered with massages and skin treatments in the award-winning Vyoma Spa. If you are hosting an important business or social event, the Radisson Blu's extensive, flexible meeting accommodation in Delhi will ensure success. Radisson Blu Hotel New Delhi Paschim Vihar is a 4-star hotel under the official classification (PDF) from the Government of India’s Ministry of Tourism. The beautiful Radisson Blu Hotel New Delhi Paschim Vihar offers 178 designer guest rooms, including 21 spacious suites, styled in harmony with the hotel's neo-Gothic theme. Rest well on rich, stylish furniture and take advantage of the generous amenities offered in these New Delhi hotel rooms. Start your morning right with the complimentary breakfast and stay connected with the help of free wireless Internet access. Handicap-accessible rooms are also available at the Radisson Blu New Delhi hotel. The Radisson Blu New Delhi Paschim Vihar Hotel offers an exceptional range of on-site dining options. Level 2 is a 24/7 diner with interactive show kitchens. Indyaki, the hotel's Indian specialty restaurant, offers an eclectic mix of traditional flavours. 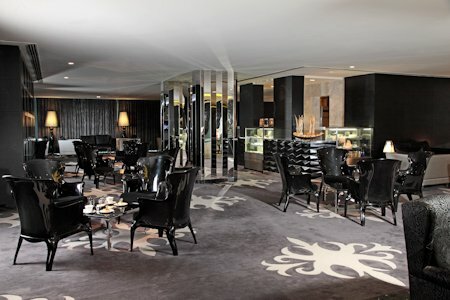 Guests also enjoy tapas at ORO, tea and coffee at the Tea Lounge and pastries at Cup Cakes. Level 2 - Located on Level 2, this 24/7 diner features interactive show kitchens and offers Indian, Italian and Asian cuisine. Indyaki - Indyaki showcases an eclectic mix of traditional flavours and Indian decor coupled with modern show kitchens. ORO The Bar - This lounge bar offers tapas and an international range of wines and spirits. Unplugged - Unplug yourself at the entertainment capital of West Delhi, with live music, DJs, a dance floor and private alcoves. Cup Cakes - Cup Cakes, the pastry shop, offers a mouth-watering range of freshly baked sweet and savoury delights. Tea Lounge - The Tea Lounge meeting place offers premium and herbal teas/coffees, soft beverages, smoothies, desserts and savouries.